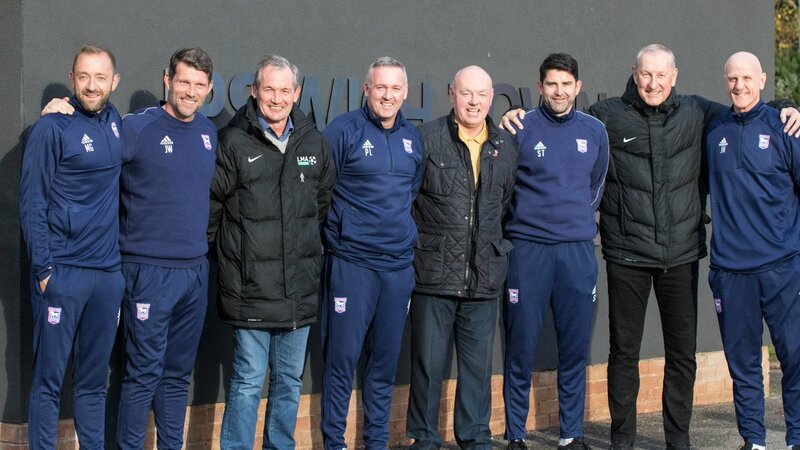 Blues boss Paul Lambert and his staff met Town legends Terry Butcher, George Burley and John Wark at Playford Road earlier today. Butcher revealed on BBC Radio Suffolk's Life’s a Pitch on Saturday that Lambert wanted to “get a few of the older boys together and talk about our opinions and things like that”. Lambert was joined by first-team coach Matt Gill, new goalkeeping-coach Jimmy Walker, assistant manager Stuart Taylor and fitness coach Jim Henry as he chatted at length with the former Blues over lunch. “It’s the first time I have been asked to come to the training ground and sit down and have a chat since I left the Club,” Burley told iFollow Ipswich. Wark added: “It was great to be invited down. It’s the first time a manager has asked me to go and have a chat and some lunch as well and I really appreciated it. The way Lambert is approaching this job keeps on impressing - and this is just another example of that. I really hope he starts getting the players responding well soon too, before the gap gets too big. I still think he'll pull us clear. A move that shows Lambert is truly invested in the club and its history. Really nice touch. Great stuff by our new manager. Now if he can make a big improvement in that goal difference column we will start to climb the table. Brilliant stuff from Lambert. He's showing a huge amount of respect for our traditions as a club and what the fans want to see. I wasn't sure if he was only joining us for a quick and easy pay day but it sounds like he's planning towards building a future here that we can all be excited about and get behind. I really hope it works out for him here. I'd be intrigued to find out what Burley and Butcher etc said as I'm sure they didn't hold any punches. If this doesn't win the fans over nothing will, well done PL. He's really winning me over is Paul Lambert so far. Maybe involving one or two others like Mick Mills and Russell Osman would be useful? If PL gets us out of this mess he may become another LEGEND alongside Sir Alf, Sir Bobby and George Burley. Great move. Would also have like some of the younger players to have been involved, Matt Holland maybe? Perhaps he needs to stay impartial due to his media work. The importance of this can't be over-estimated. It's linking the present club back to its history and makes me feel all warm inside, which is going some as I'm an absolute sod most of the time. Strangely, this is the most optimistic I've felt about the club in years, not on the pitch, but that isn't the be all and end all of a club like ours. The other weekend, I went to watch Darlington play Boston Utd in the Conference North...now that was fun as the fans and the club are one and the same. We need to get that back and it's not been there since Magilton. A great move by PL and i'd love to see what they said to him and what he took from the conversations. PR stunt or not, this is a real positive, a gesture that seems to have been lacking with other managers. Actions like this surely must win fans round, which is what we need for the potential relegation scrap we're in. A shrewd move to show he's mindful of the club's history and what it means to be a Ipswich fan. Well done Paul Lambert, my favourite Town manager for a decade! Even if he ignores all of their advise, by doing this has got them on his side - so they'll be more positive about him when asked by whatever media outlets ask - clever management! There's no shame in turning an action into a good piece of PR, providing it's something truly authentic – which this clearly is. Well done Town, PL and all those who attended and shared their views. COYB. Very astute move by Paul Lambert. Smart cookie this guy. Really can't remember Lambert looking so happy! Reading between the lines it certainly appears Lambert is here for the 'long haul', something personally I hadn't anticipated, considering 'whistle stop' previous employment! Supporters will need to take a 'reality check' and have realistic aspirations in regards to this season's outcome! IF the manager 'starves off' the bookies favourites for the Championship exit door, then for fans and football club it will be a 'massive bonus' but if 'instant upturn' fails patience will be required from all! A contingency plan is undoubtedly in place, as Lambert strives towards 'unity' from all corners! League 1 football is far from ideal but there's positives to take if the 'undesirable' unfolds, Lambert has worked at 'lower levels' and been successful, without sounding 'sarcastic' hapless Hurst had signed 'good' lower league footballers thus instead of 'bobbling' in and around the lower reaches of the Championship amid poor attendances we may find Portman Rd 'packed and rocking' taking Div 1 by storm playing attractive football thus building 'momentum' for 'higher challenges' ahead ! Whatever this season brings let's all hope the 'fractured nature' of the club becomes 'galvisned' under ( hopefully) Lambert as he aims to put this 'massive club with history' ( Lambert's words ) back where it belongs 'entertaining the Premiership'! Really impressive move from Paul Lambert. Certainly I am very pleased since he arrived. The sense of belonging is most definitely happening now for the first time in many years. Long may it continue and with legends such as Butcher, Burley and Wark continuing to help where they can. All of them look delighted in the photograph. “It’s the first time I have been asked to come to the training ground and sit down and have a chat since I left the Club,”- what an awful state of affairs. Love this, just seeing the three legends together makes me wanna pee myself with excitement! Well done lambert... a fairly easy thing to do, but clearly no other manager from the last 15 years has managed to do it! !